way, the Bure Valley Railway, the Perrygrove Railway and the Kirklees Light Railway I have come to appreciate the historical significance of fifteen inch gauge railways and the contribution made by Sir Arthur Heywood, Wenman J. (Wynne) Bassett Lowke and Henry Greenly. What I have aimed to do in this posting is provide a historical snapshot of the development of 15" gauge railways in the UK. However, there will inevitably be some omissions and no doubt some inaccuracies. The sources I have consulted seem fairly clear about the origins of 15" gauge railways but once they started developing and spreading across the country there seems to be some ambiguity and occasionally some contradiction. Please, if you spot any omissions or errors, or have further information on any of the railways listed, please contact me or leave a comment at the end of the posting. 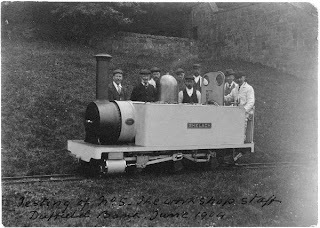 Arthur Percival Heywood was a pupil at Eton College where it is suggested that he and his family became acquainted with George Callendar who at the age of 17 in 1866 constructed a 12" gauge miniature railway on his estate beside Loch Fyne at Ardinglass House. 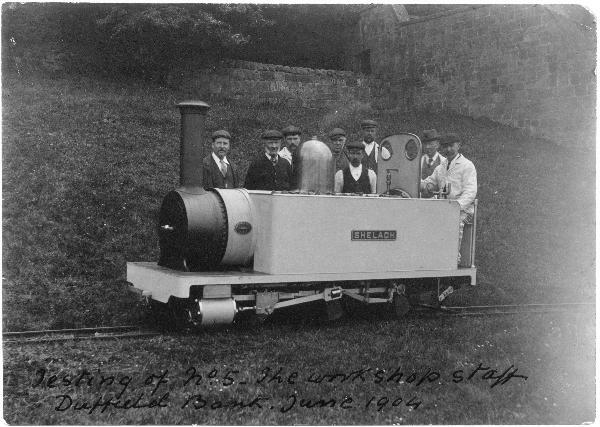 As a boy Arthur had already constructed 4" and 9" gauge locomotives, the latter for transporting his younger brothers and sisters around their estate at Duffield Bank. In 1874 he constructed a short length of 15" gauge railway from the family house to the road. This railway was later extended for around half a mile via a 1:12 gradient into the wooded hillside behind the house. Arthur was interested in developing and demonstrating what he considered to be the narrowest viable gauge of railway for commercial use and hence he dubbed 15" as 'the minimum gauge'. At Duffield he perfected the design of minimum gauge locomotives, stock and permanent way. ......... which gave considerable flexibility to the wheelbases of 0-6-0 and even 0-8-0 locomotives. To demonstrate the commercial and military potential of the minimum gauge, his railway at Duffield Bank included three tunnels and a 91' long, 20' high wooden viaduct. 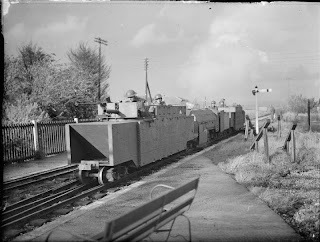 The rolling stock at Duffield Bank not only included four wheel wagons and coaches of various types, Arthur also constructed a dining car (which included a small kitched) and a sleeping car to show just what was possible on a minimum gauge railway. The Duffield Bank Railway survived until 1916 when Sir Arthur Heywood died and the railway was dismantled and the stock sold off to other 15" gauge railways. Arthur Heywood demonstrated the virtues of his railway system at various open days, shows, exhibitions and trade fairs around the country and, following one such event in 1894, the Hon Cecil Parker, agent to the 2nd Duke of Westminster, persuaded the Duke that a 15" gauge railway would solve some of the problems of transporting supplies and produce to and from the Duke's Eaton Hall Estate near Chester and its nearest mainline railway station 1½ miles distant. In the 1890s, estate at Eaton Hall consumed around 2000 tons of coal and 3000 tons of general stores each year, and transported goods outward from the estate's brickworks, sawmills and pipeworks. The Duke agreed to the railway provided it did not interfere with the view. Arthur Heywood surveyed and personally supervised the construction of the railway between the estate and Balderton Station on the GWR branch from Chester to Wrexham. The line initially used one locomotive, an 0-4-0 called Katie which was similar in design to the Duffield Bank locomotives. In 1901, an 0-6-0 was delivered and named Shelagh after the Duchess. In 1916 a third locomotive, 0-6-0 Ursula, joined the railway. The railway proved its worth, handling around 6000 tons of freight annually. In addition, the Duke made extensive use of the railway to carry passengers including King Edward VII, Queen Alexandra and Winston Churchill who, on being transported to a pigeon shoot commented "I'd much rather play at trains!" A further notable passenger on the railway was a local resident, the young L.T.C. 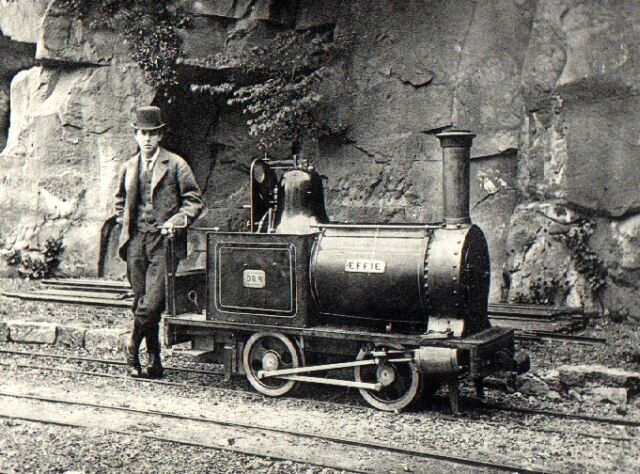 (Tom) Rolt who later gained fame as the instigator of the Talyllyn Railway Preservation Society, the first of its kind in the world. The Eaton Railway became the testing-ground for another pioneer of minimum gauge railways, Wynne Bassett-Lowke who was largely responsible for the development of 15" railways for pleasure. The Eaton Hall Railway survived until the Second World War and was dismantled in 1947. In 1996, part of the railway was reconstructed and a loop created around the cricket pitch. 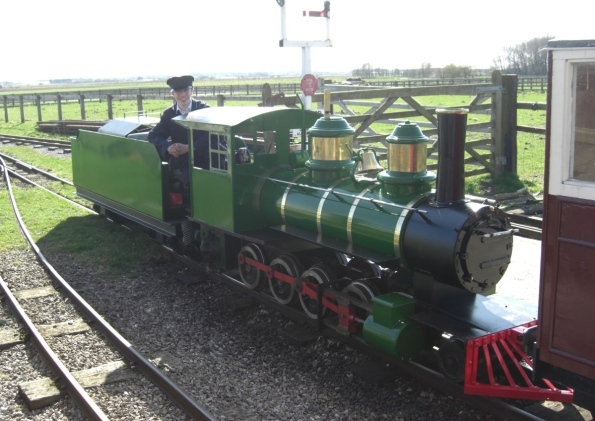 A replica of the line's original loco, Katie, now hauls passengers in replica coaches on the Hall's annual Open Days. Charles Bartholomew built a 15" railway from his home, Blakesley Hall, to the local mainline railway station. 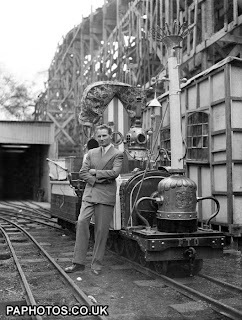 Initially he used two 4-4-0 steam locomotives built by Cagney Brothers in the USA but found that these lightweight locomotives were insufficiently powered for his railway which he used to haul freight up a 1:100 incline from the station to the Hall. 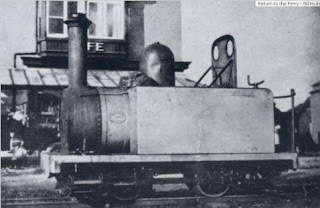 As an engineer, in 1905, Bartholomew decided to build his own internal combustion powered locomotive, Petrolea, reputed to be the first example of a diesel locomotive in the world, . He later persuaded his friend, Bassett-Lowke, to construct another i/c powered locomotive for the railway, Blacolvesley - the only non-steam loco which Miniature Railways of Great Britain Ltd. built. The railway survived until 1947, though Blacolvesley is now preserved by the Ravenglass & Eskdale Railway. 1904 - Miniature Railways of Great Britain Ltd. 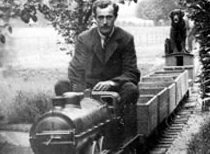 In 1904 Wynne Bassett-Lowke and Henry Greenly established a company called The Miniature Railways of Great Britain Ltd. aimed at 'equipping gentlemen's estates and parks with complete railways'. They were interested in producing quarter-scale models of locomotives to run on 15" track. By 1905 their first locomotive, 4-4-2 Little Giant was ready for testing on the Eaton Railway before taking up its duties on the ¼ mile miniature railway at Blackpool which proved to be very popular. 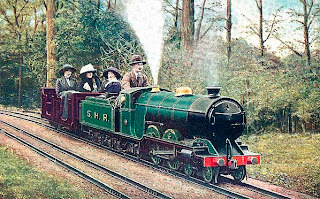 The company constructed further miniature railways at Sutton Coldfield in 1908, Nancy in France in 1909 and at Halifax Zoo in 1910 using the equipment from Blackpool - the railway there being closed owing to the adverse effects of sand on the stock. 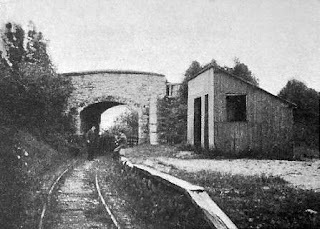 The company opened a second 15" gauge railway in Sutton Park in Sutton Coldfield, being a conversion from the original 10¼" gauge railway. 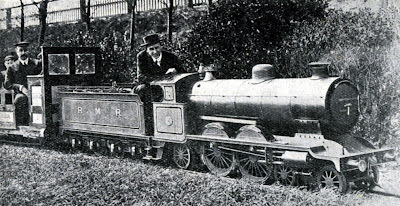 The railway ran some of Henry Greenly's most successful designs of locomotives, including the Mighty Atom. The line closed in the 1960s but the stock was held in storage until it was rescued by the Cleethorpes Coast Light Railway in 2001 where it has now been restored and is run as the Sutton Collection. 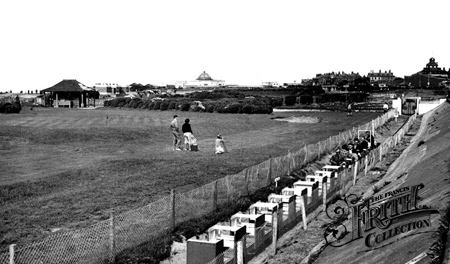 The zoo was opened in 1909 and the following year a miniature railway was added using the equipent from the now closed railway on the beach at Blackpool. The Greenly locomotive Little Giant was aptly renamed Little Elephant, and for a while hauled passengers around the exhibits though some visitors complained that sparks from the locomotive set fire to their hats! 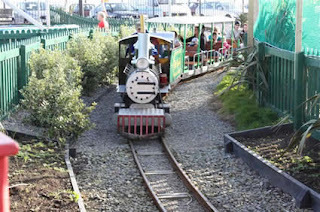 After providing a railway for the International and Universal Exhibition in Brussels, the company opened a mile long miniature railway around the marine lake at Rhyl in North Wales. The line initially managed with one Atlantic locomotive, Prince Edward of Wales, until 1913 when another loco, George V arrived from Southport. 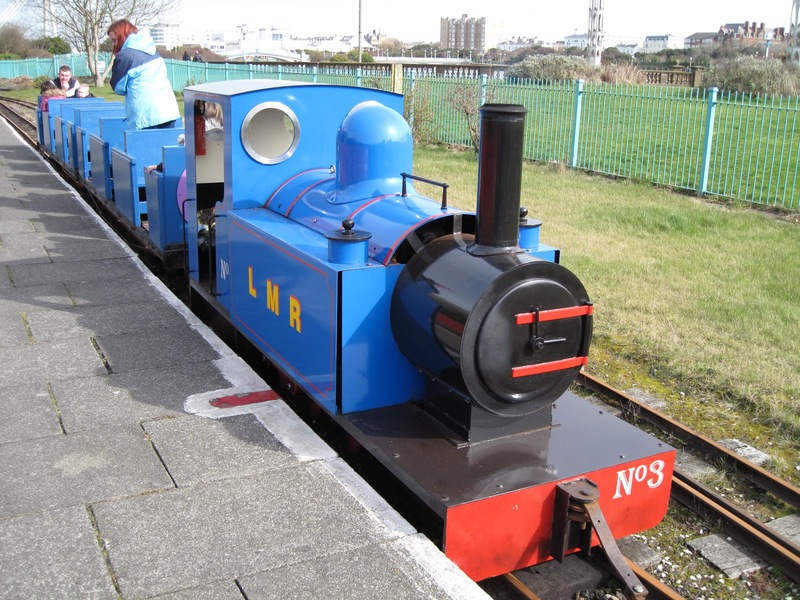 In 1920 and 1921, three more powerful Atlantic locomotives designed by Henry Greenly, named after the owner's children and built at Rhyl entered service, the original two locomotive being sold to Margate and Skegness. 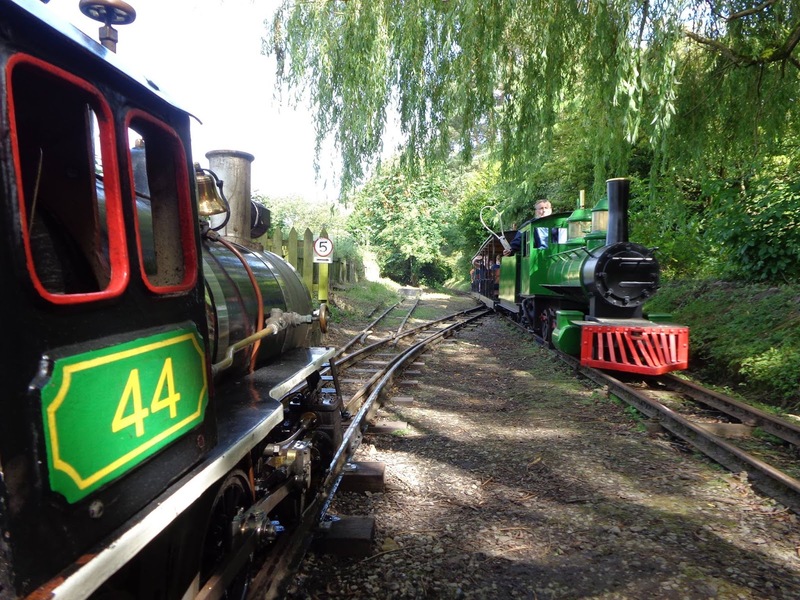 The railway is still functioning today with three Rhyl constructed locomotives which have been restored and returned to their place of origin following quite varied careers at miniature railways across the country. In 1912, Miniature Railways of Great Britain Ltd. went into liquidation and Narrow Gauge Railways Ltd. was formed out of the ashes. The line ran for ½ mile on the shore of the Marine Lake from Lakeside to Pierhead. The railway originally ran two NGR Class 10 Atlantic locomotive (George V and Princess Elizabeth) and in 1913 added a Class 20 (Prince of Wales). For a short while the railway used Heywood's 0-4-0 locomotive, Katie, originally from the Eaton Railway and then the Ravenglass & Eskdale, before she was passed on to the Fairbourne Railway in 1923. In 1938, the railway was extended to 1¼ miles. In 1948 the then owner of the railway, H.N. Barlow constructed a 4-6-2 steam outline petrol-electric locomotive, Duke of Edinburgh, based loosely on a Gresley A4 pacific. 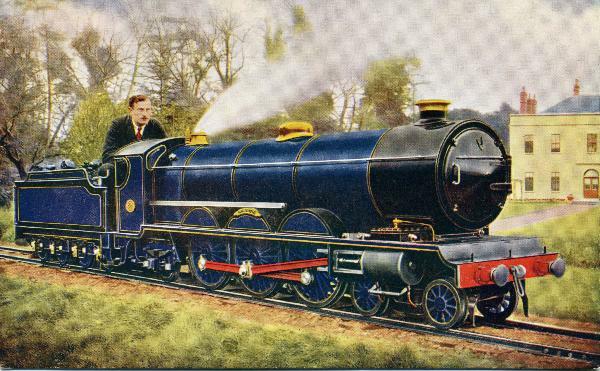 This loco was followed by 4-6-2, Prince Charles in 1954 and 4-6-0 Golden Jubilee in 1963. In 1971, Severn Lamb delivered Princess Anne and in 2006, Austin Moss of the Windmill Farm Railway provided Jenny - a 2-6-2 steam-outline side tank diesel hydraulic locomotive with an overall cab. 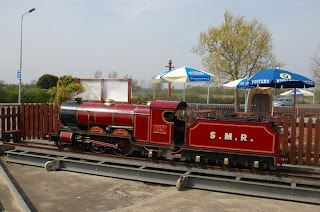 The LMR claims to be the oldest miniature railway which has run continuously without closure (Rhyl Miniature Railway having been closed during World War II). Between 1911 and 1913, Captain J.E.P. Howey of Staughton Manor oversaw the re-gauging of his 9½" railway to a 15″ gauge railway, which included an impressive wooden model based on the Forth railway bridge. He also purchased a NGR Pacific Class 60 locomotive named John Anthony after his son which was only the second 4-6-2 loco in Britain. It was tested and stored at Eaton and was eventually sold the the Ravenglass & Eskdale Railway where it survived until 1927 under the name of Colossus. 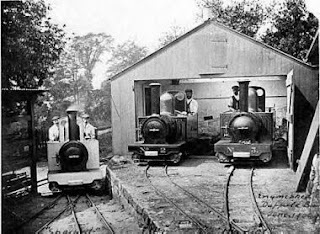 The Sand Hutton Light Railway was constructed on the estate of Sir Robert Walker the Fourth Baronet of Sand Hutton, some seven miles east of York. It started life as a 15" gauge miniature “estate railway” but between 1920 and 1922 developed into a much longer 18" gauge Light Railway, 5¼ miles in length. 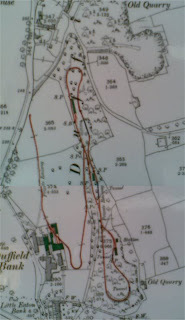 The original 15" gauge line ran for 1,245 yard from Sand Hutton village through Greystone Plantation to the Hall. At the start was Villa Station with Garden Station where there were the engine and carriage sheds. The line then ran up a steep bank and carried on through open country before reaching the lake, which the line skirted with two bridges before arriving at Fishpond Station. By May1920 the railway was extended by three miles from the mainline station at Warthill to Sand Hutton, with a branchline to the brickworks at Claxton. However, the closure of the 18" gauge railway at Deptford Meat Market in December 1920 resulted in the purchase of stock and track at a knock-down price and the railway was converted to 18" gauge in its entirety. The 18" gauge Sand Hutton Light Railway survived until 1932, hauling agricultural produce, coal and bricks from the Claxton Brickwords to and from Warthill Station on the mainline. 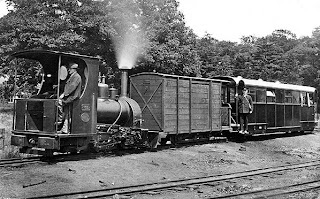 Starting life in 1875 as a three foot narrow gauge railway, the Ravenglass & Eskdale Railway was converted in stages to 15" from 1915 to 1917. It was the realisation of Bassett-Lowke's and Henry Greenly's ambition of creating a 'real' minimum gauge railway to demonstrate its potential. 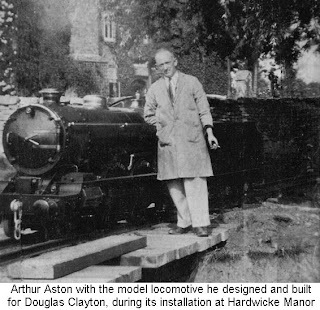 After a shaky start with underpowered locomotives (including Katie on loan from the Eaton Railway), the railway ultimately achieved Sir Arthur Heywood's dream by becoming a fully functioning minimum gauge community railway. To handle the increase in freight, Henry Greenly, the engineer for NGR designed the first 2-8-2 locomotive in the UK, River Esk, which was constructed by Davy Paxman & Co of Colchester. The railway continued to improve and prosper through the Depression of the 1920s but was closed to passenger traffic during the Second World War. The railway is still very much in business, running many of the line's early locomotives and some refugees from other 15" gauge railways, including Synolda from the original Sand Hutton Miniature Railway. 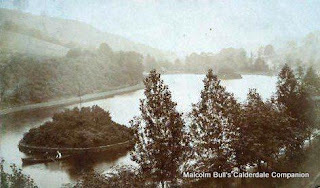 The Pleasure Gardens were opened by Joseph Bunce in 1880 which gave rise to the local name for the gardens - Sunny Bunces. The miniature railway acquired the NGR locomotive Little Elephant (formerly Little Giant) when Halifax Zoo closed and in 1922 renamed it Baby Bunce in honour of the birth of the owner's granddaughter, Lionne Bunce. 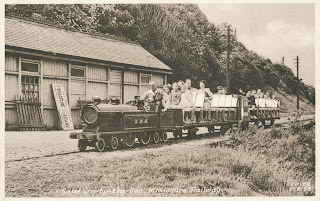 The miniature railway was only 200yd in length and included dummy passengers. It survived in various forms until 1953. The Fairbourne Railway was originally built in 1890 as a 2' narrow gauge railway to transport building materials for the development of the area by Arthur McDougall (later to become a flour entrepreneur). 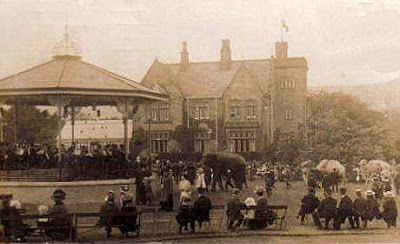 It later became a horse-drawn tramway for visitors to the resort. 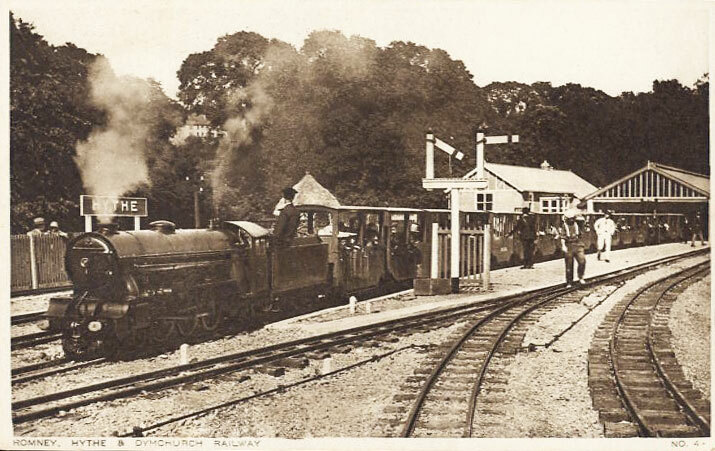 It was taken over in 1916 by John Wills and converted to 15" gauge, running from its terminus beside the mainline railway station to the Barmouth ferry at Penrhyn Point. The line began by using the last of the NGR Class 20 Atlantic locos, Prince Edward of Wales, and five coaches, until the railway ran into financial difficulties and the loco was sold to Llewelyn's Miniature Railway at Southport. 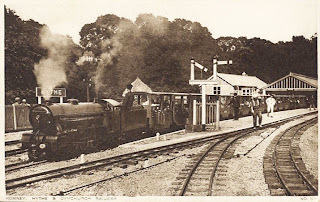 In return, the railway received Sir Arthur Heywood's Katie which had started life on the Eaton Railway, moved to Ravenglass, and then to Southport. Katie became increasingly unreliable and survived at Fairbourne until 1926 when she was scrapped. In the meantime, the railway acquired a NGR locomotive from Count Louis Zbrowoski's railway at Higham Park after he was killed in a motor racing accident. She was named Count Louis in his honour and continued hauling passengers up to the outbreak of the World War II, accompanied by a 9hp Lister petrol locomotive. The railway closed during the war and needed complete restoration between 1947-8. Count Louis resumed duties with three internal combustion powered locos. The railway experimented with a range of different combinations of 15" gauge locomotives until in 1985 the railway was converted to 12¼" gauge. Over the years, the railway continued to face financial difficulties and at the time of writing there is some doubt as to whether it will be able to continue owing to the death of its owner. 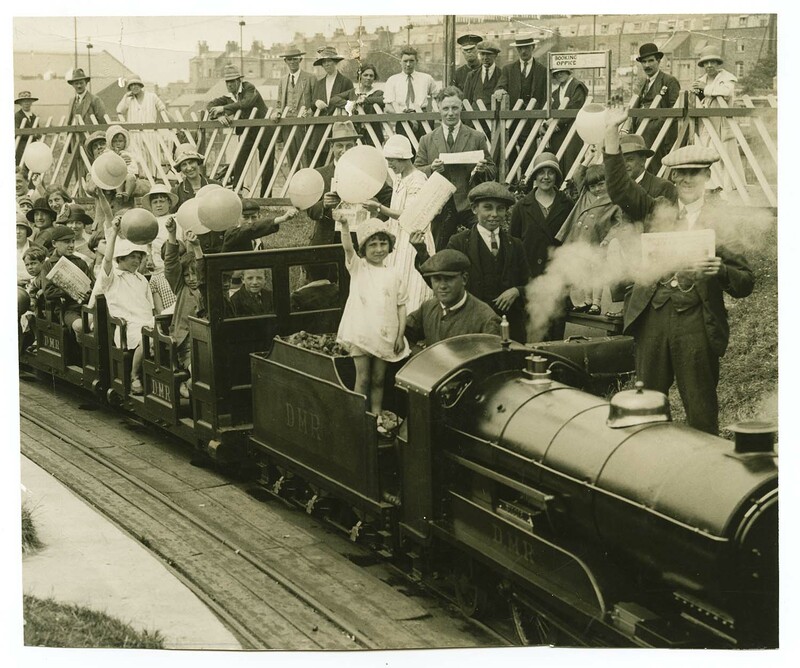 The Dreamland Miniature Railway opened in 1920 as a major attraction in the newly inaugurated Dreamland Amusement Park in Margate, England. Initially the railway comprised of a short circuit, of approximately 375 yards, which was operated by a Bassett-Lowke Class 10 locomotive, Prince Edward of Wales. Three years later, the line had been transformed into an end to end line of around 600 yards in length. The Bassett-Lowke locomotive had also been joined by 'Billie', an Albion class locomotive built by Albert Barnes of Rhyl, which was now used as the main locomotive. The railway operated in this form for most of its 60 year life although it did experience several changes. The two steam locomotives were joined by a petrol locomotive in the late 1950s and soon after this the Bassett-Lowke locomotive was retired and sold. The station in the gardens appeared and disappeared several times and the rolling stock was rebuilt with access only being available on one side. The park went through several changes of owner in the subsequent years and eventually the railway closed in 1980 after several years of neglect. The only remaining relic of the railway today is the alley it ran down after leaving Park Station. 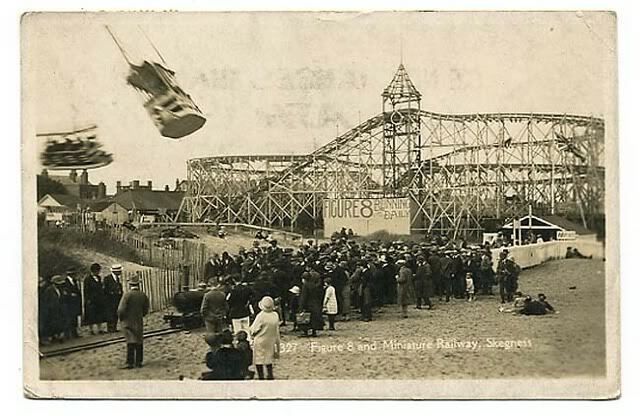 The railway ran from the pier along the North Parade to Pleasureland where there was a balloon reverse loop. 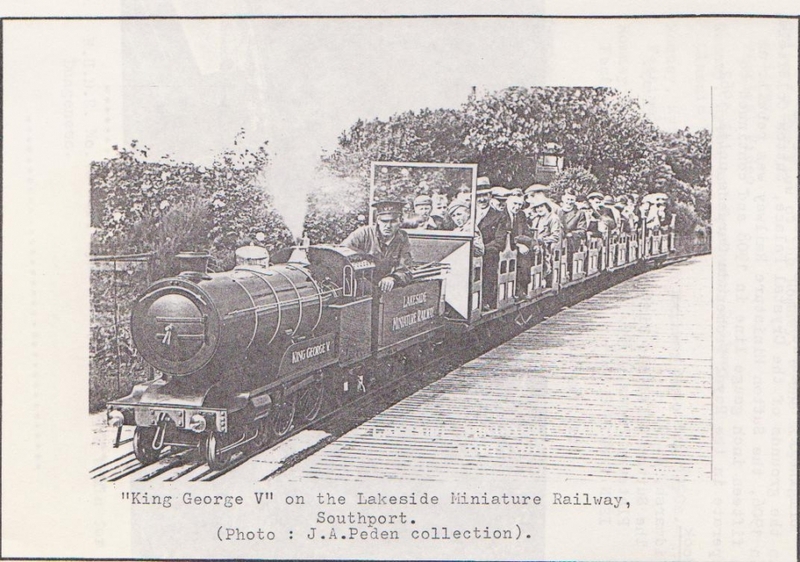 This was a short-lived railway, ¼ mile in length, which ran along the shore of the Medway in Cuckold's Woods on the Isle of Grain, and played host to one of the locos from Rhyl, Michael. 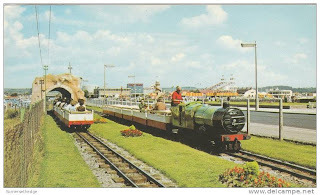 By 1926, the railway had closed and the locomotive passed on to the Saracen's Head Amusement Park in Cheshire. Count Louis Zborowski was a friend, fellow motor racing driver and railway enthusiast of Capt Howey of Staughton Manor. One of his claims to fame is that his three racing cars were called Chitty Bang Bang 1-3, which inspired the subject of Ian Fleming's children's book. 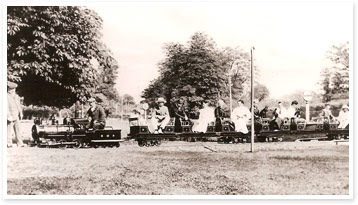 In 1924 the Count commissioned the construction of a 15" gauge miniature railway on his estate at Higham Park. Although the railway was completed the Count was unfortunately killed in a motor racing incident in the Italian Grand Prix of 1924 and so was never able to see the project through. 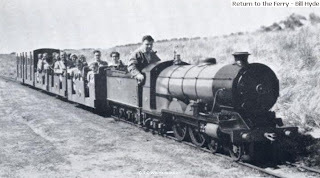 The locomotive which the NGR company had constructed for the railway was sold to the Fairbourne Railway and named Count Louis in his honour. 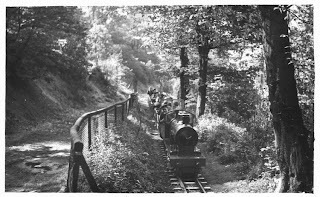 For a short period, there was a 15" gauge railway at the Saracen's Head Amusement Park at Warburton in Cheshire. 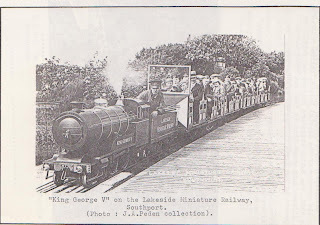 The locomotive which ran on this short 200yd railway was the Greenly locomotive, George V Jnr, formerly Michael from the Rhyl Miniature Railway. Horse races were also held there and one day (in 1928?) a horse broke its fetlock when crossing the track near the points, and so the railway and stock were sold to Belle Vue Zoo in Manchester for £300. 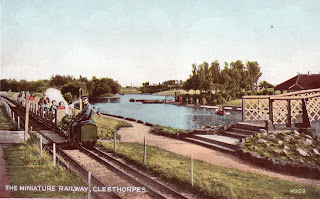 Some sources I have consulted mention that the first miniature railway in Cleethorpes was 15" gauge and constructed during the 1920s. 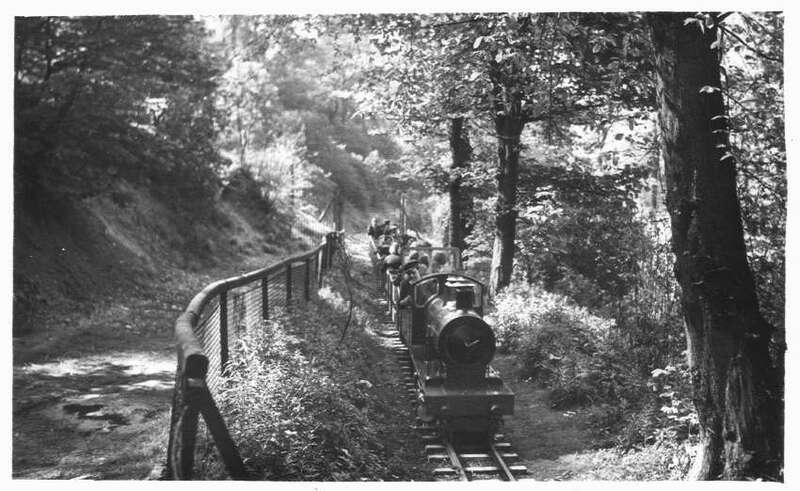 Another source suggests the first miniature railway was constructed in 1948 to a gauge of 14½" and later converted to 15" gauge. 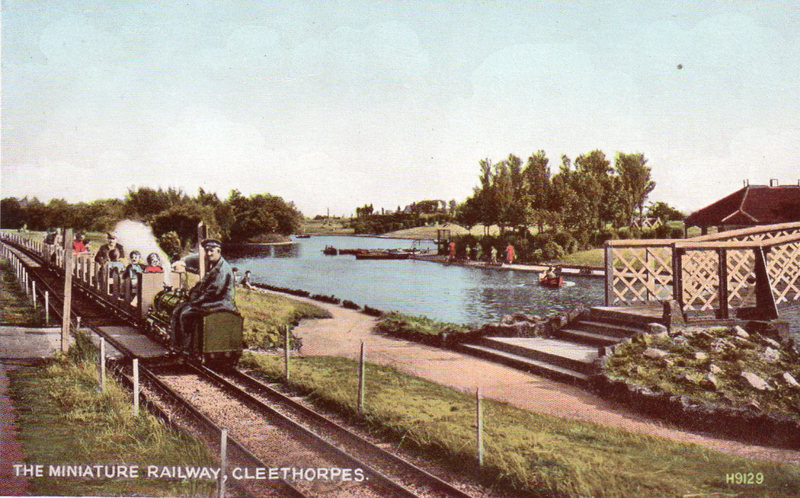 Another source suggest that the first miniature railway in Cleethorpes was 10¼" gauge railway, constructed in 1947 and was not converted to 15" until 1972. Whatever its origins, the railway still survives and is very successfully run as the Cleethorpes Coast Light Railway, retaining its gauge of 15". It also houses the original Bassett Lowke 4-4-0 locomotive (Mighty Atom) and a replica of Heywood's 0-4-0 locomotive - Effie. 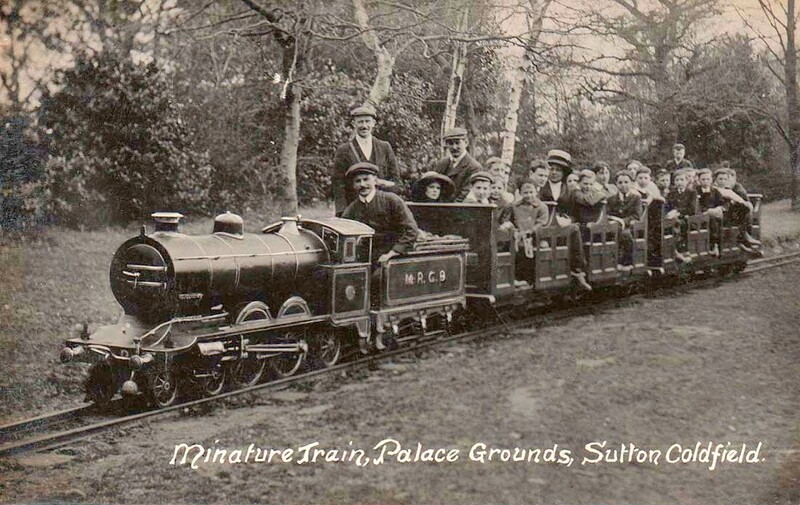 It has also rescued the locomotives and much of the stock from the Sutton Miniature Railway. It was Count Zborowski's intention to find a location for the construction of a double- tracked 15" gauge mainline using powerful and fast locomotives. After his death in 1924, his quest was continued by his friend and fellow racing-driver, Captain Howey, from Staughton Manor. The ideal location was found on the Romney Marshes and in September 1925, Howey gave the go-ahead for the project to be realised. By December track had been laid at the station in New Romney. The railway was officially opened in July 1927, with the first 20 coach train hauled by a 4-8-2 Davy Paxman locomotive, later to be named Hercules. Before long the railway was operating 20 trains a day with a roster of up to seven locomotives. By September 1928, the line had been extended from New Romney to Dungeness with additional coaching stock to meet increased demand. The new carriages included steam heating and electric lighting to cater for winter traffic. During the Second World War, the railway closed to public traffic and, after Dunkirk, as the railway was more or less in the front line as far as the invasion-risk was concerned, it was pressed into service by the army to transport defence materials along the coast. In addition, some of the stock was converted into an armoured train. Immediately after the war, the railway prospered, with a temporary increase in goods traffic from shingle required for post-war rebuilding work across the country and from the an increase in tourism arising from the popularity of holiday camps. However, the railway's infrastructure generally deteriorated and Howey's death in 1963 led to an uncertain period when the long-term future of the railway was in doubt. A concerted effort to save the railway in 1972 resulted in some investment, most notably from W.H. McAlpine. Over the years, the railway has been steadily restored and improved and, although passenger traffic is not as great as it was in the early days of the railway, it still provides a local service and enjoyment for visitors to the south coast. 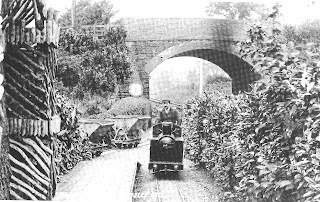 The miniature railway was located on Woodgrange Drive and was established by WH Bond. It was taken over in 1932 by Nigel Parkinson of the Great Yarmouth Miniature Railway who extended the railway by adding a tunnel and a new station. Two locomotives were acquired, George V from Skegness and Synolda from the Sand Hutton Railway. The railway survived until 1938. 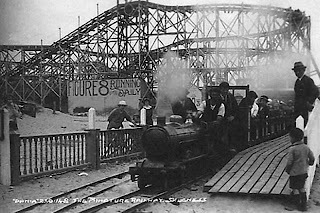 The railway survived almost to the end of the park which closed in 1977. 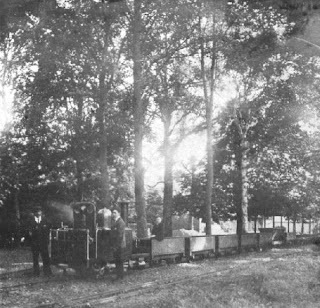 The railway was relocated in the grounds on a number of occasions. 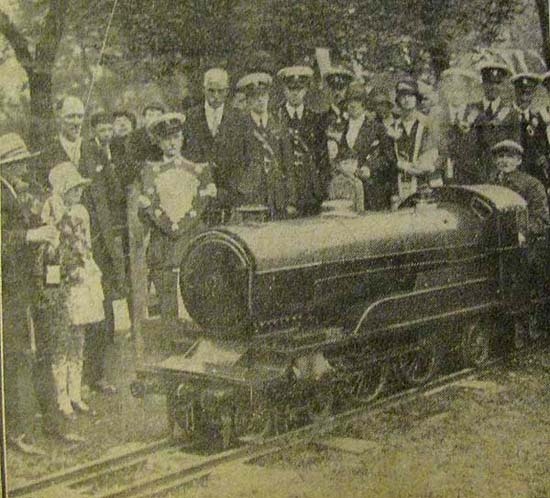 The picture shows the original Bassett Lowke / Greenly loco, Railway Queen at the opening ceremony in 1928. Having built a 14" gauge railway in his garden, Nigel Parkinson decided 15" was a more viable gauge for a commercial railway and so invested in a railway beside the beach in Great Yarmouth. The line was 600 yards long in the form of a balloon loop. An elaborate booking office and waiting room straddled the tracks at South Dene Station which boasted two island platforms. The track ran down a 1:80 incline to 33yd long tunnel before climbing a 1:72 gradient to return to the station. Parkinson was meticulous in his attention to detail and insisted that the railway was fully signalled. The main locomotive was the NGR Mighty Atom, renamed Prince of Wales while the coaches were replicas of bow-sided mainline corridor stock, complete with dummy corridor connectors. 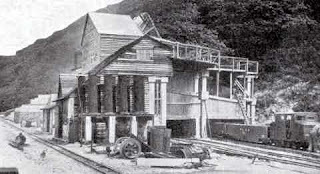 The railway closed in 1937. The Porthcawl Miniature Railway was 440yds in length, running from Salt Lake to Coney Beach. It had a passing loop and a tunnel which doubled as the stock shed. It used exclusively petrol driven locomotives in steam-oultine form. 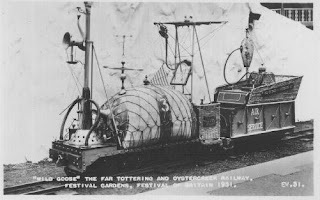 The first loco, Coney Queen, was constructed locally using the hydraulic fin controls from a submarine. The second loco, Silver Jubilee, used and Austin 8 engine and the electric drive from a bus. 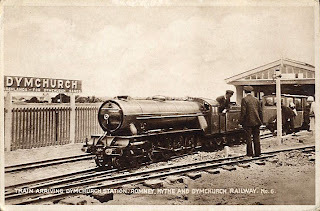 The coaches were the redundant four wheeled stock from the Romney Hythe and Dymchurch Railway. After the railway closed in about 1986, everything was sold for scrap. Silver Jubilee and a few coaches were bought by an individual who was laying a 15" gauge line on the Severn Valley Railway. It was then sold to the Windmill Farm Railway in Burscough Lancashire and its current owner acquired it from there in 2002. In 2010 its currently in poor shape, dismantled and missing the petrol engine. The Bellevue Park Railway acquired its locomotive and carriages in 1933 from Blackpool. The line ran from Bellevue to Bell Hazel with tight balloon reversing loops at each end. The locomotive used on the line was a German-built 0-4-0 tender engine named Sir Crawford which originally ran on the Romney Hythe and Dymchurch Railway. Before long the loco was renamed Jean, and when the line closed in 1950, it was rescued by Sir William McAlpine and returned to the Romney, Hythe and Dymchurch and restored under its original name, The Bug. This mile long private railway was owned by Douglas Clayton, director of the Cannon Iron Foundries at Bilston. He began planning the construction of his railway before the First World War but it was not until 1933 that he completed his first locomotive, 4-4-2 Douglas Clayton, which was based on Henry Greenly's original plans for his Class 30 locomotives. 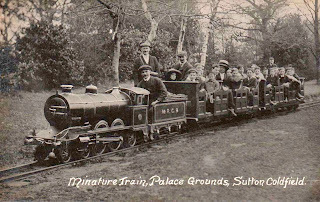 The railway ran until 1946 when Douglas Calyton died and the railway and stock were sold on to the Sutton Miniature Railway where the loco was rebuilt, given GWR Hall style cylinder covers and renamed Sutton Belle. The locomotive is now owned by the Cleethorpes Coast Light Railway. 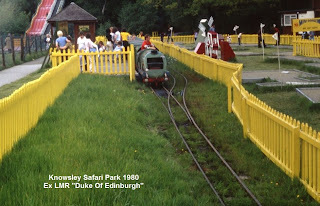 The Dudley Zoo Railway was set up in 1938 as a 10¼" gauge railway by Trevor Guest. This first railway was about 800 metres in length and included a station and a balloon loop with some rather severe gradients. When it opened the railway had two steam locomotives, Lady Sonia and Sir Richard built by Guest & Saunders Light Engineering of Stourbridge. Following the war, it was decided to rebuild the railway and increase the gauge to 15". This line opened at Whitsun in 1947. 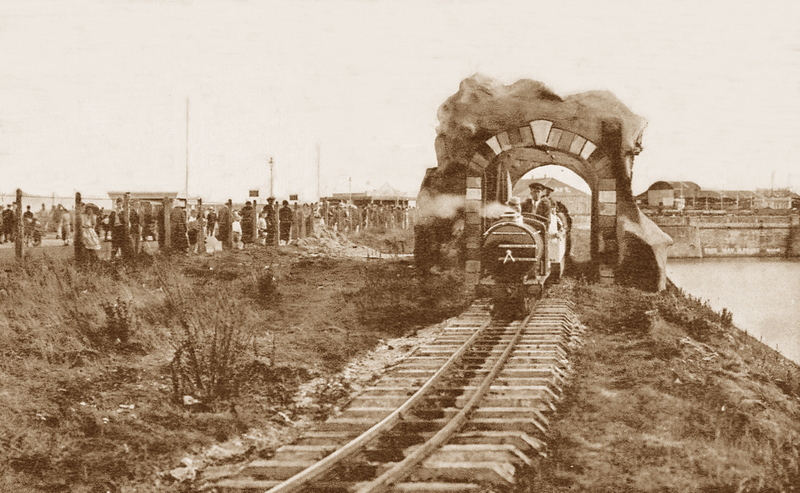 The layout was simplified by the removal of the balloon loop which made for some interesting running as the trains ran in reverse on the return journey guided by the guard who rang a bell to communicate with the driver. The motive power for the 15" railway was initially a petrol powered railcar based on a GWR 'Flying Banana' prototype. This was joined in 1948 by a US steam outline loco. 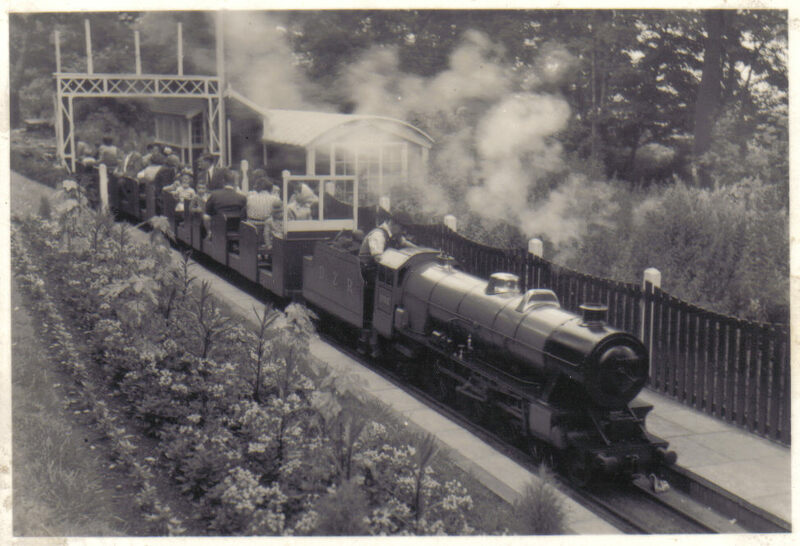 In 1949 the line acquired a 4-6-0 steam locomotive (Prince Charles) based on an LMS Class 5 and in 1950 a 4-6-2 loco. In 1956, EW Twinings produced a 2-4-2 steam locomotive, Katie, based on a colonial narrow gauge design. Katie was sold to the Fairbourne Railway in 1965 and is now based at Windmill Farm. In 1957, a double ended diesel powered locomotive joined the railway to be joined in 1960 and 1961 by two further internal combustion powered locos, the latter being an 0-4-2 steam outline loco called Clara. During the early 1960s, the two original 15" steam locos were sold to the Fairbourne Railway, the 4-6-2 being renamed Ernest W Twining. When opened in 1947, the Saltburn Miniature Railway, was ¾ mile in length and used a small 2-4-0 petrol engined locomotive and the Bassett Lowke 4-4-4 Blacolvesley petrol locomotive, renamed Elizabeth, from the Blakesley Hall Railway. The 2-4-0 lasted only one season and Elizabeth continued in service until 1960 when a 4-6-2 steam outline diesel electric loco, Prince Charles, arrived from the Lakeside Railway in Southport. 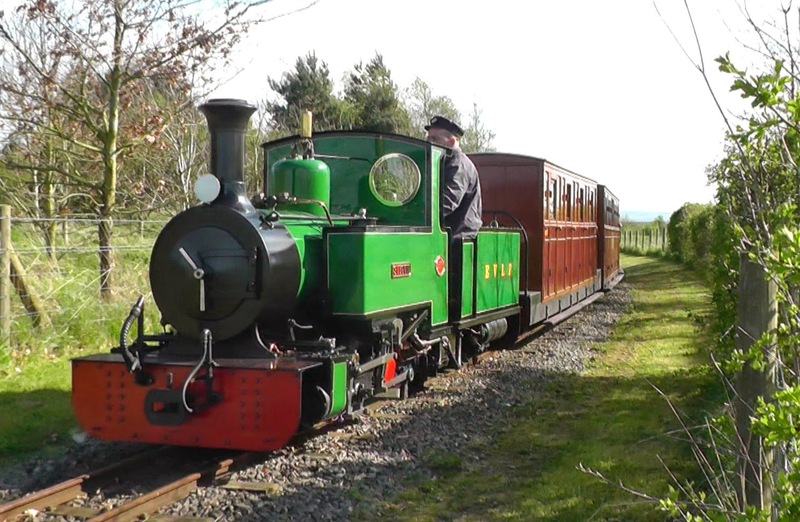 Blacolvesley has now been preserved by the Ravenglass & Eskdale Railway. 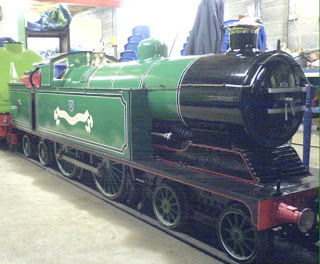 A small 0-4-0 locomotive, George Outhwaite, was acquired in 1994 and a diesel hydraulic replica of the Flying Scotsman was added in 2006 and is awaiting restoration. In 1953 a siding was added to allow for trains to pass and the railway was further extended between 2000 and 2003 by the addition of run-round loops and engine sheds. Perhaps the most bizarre 15" gauge railway was inspired by Roland Emmett's cartoon depiction of the Far Twittering and Oystercreek Railway which was constructed for the Festival of Britain at Battersea in 1951. Three locomotives were supplied for the railway by Barlow of Southport, based on his standard 4-6-2 Diesel Electric chassis. The locos were saddle tank Nellie, "paddle steamer" Neptune and Wild Goose, styled on a hot air balloon. 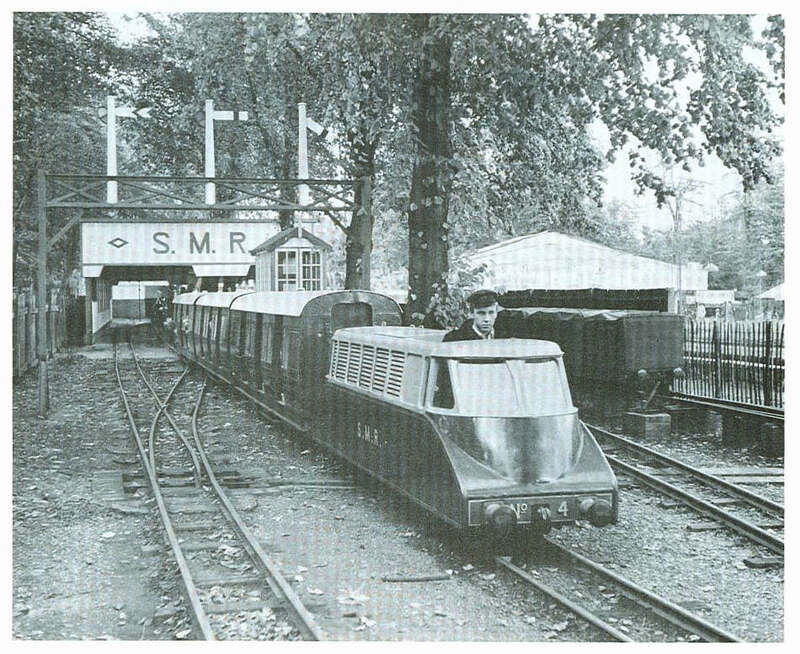 Although the festival closed at the end of the year in 1951, the railway survived at Battersea Park until 1953 when the stock was retuned to Southport and the locomotives were rebuilt with bodywork resembling the LNER A4 class. In 1954 two of the locomotives, renamed Princess Anne and Princess Margaret returned to Battersea, where the line had been relaid. There is some uncertainty as to whether the third locomotive, Prince Charles also returned, although it still survives at Windmill Farm. The line closed in 1975 and the two locomotives went to the planned Medina Valley Railway on the Isle of Wight, but they were scrapped in the early 1980s after the failure of this venture. 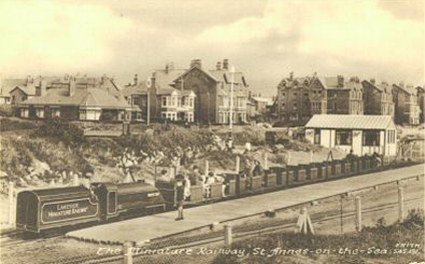 The original miniature railway at Lytham St Annes was a 15" gauge line which ran from the seafront and through the dunes for about ¼ mile, partly following the route of the existing 10¼" railway. The locomotives were supplied by Barlows of Southport and it is believed that the coaching stock formerly ran on the Far Twittering and Oystercreek Railway at the Festival of Britain. The railway was closed in the 1970s and later replcaed by the present 10¼" line. 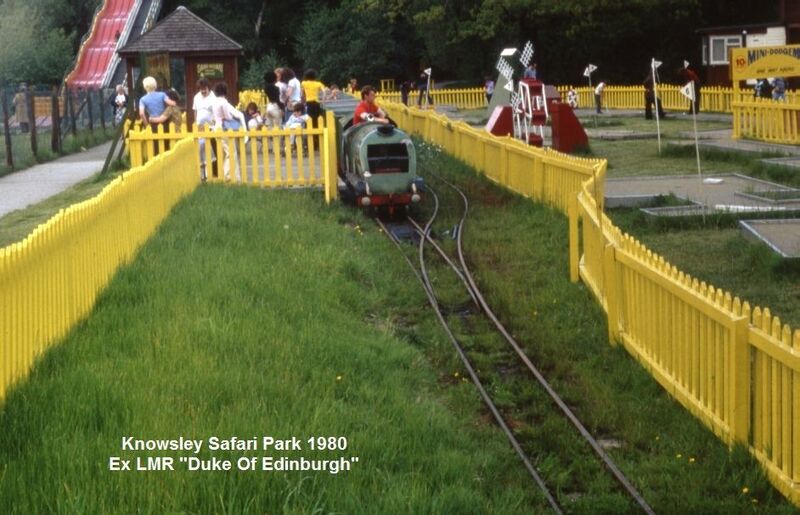 In 1964 Minirail approached Lord Bath , with a proposal to build a narrow gauge railway at Longleat. A 10 year lease was agreed and by August 1965, the track had been laid and the railway was ready to be opened. 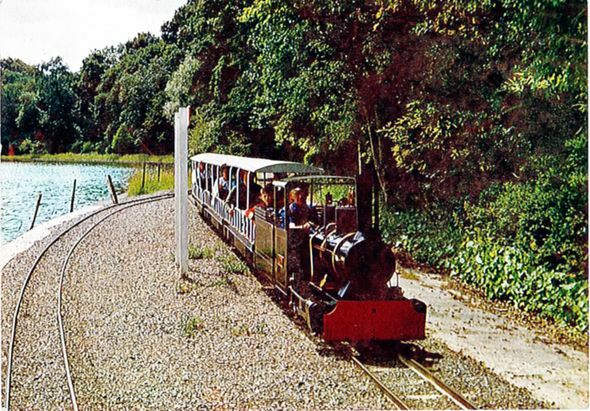 The original L-shaped layout was later extended to run further beside the lake with a third change made to provide a return loop through the woods to the main station. In 1998 a tunnel was added to the line to enhance the ride for passengers. The railway has one steam locomotive (No. 6) and two diesels, Flynn and a railcar called Lenka. A further 0-8-2 diesel locomotive Ceawlin, acts as a reserve. 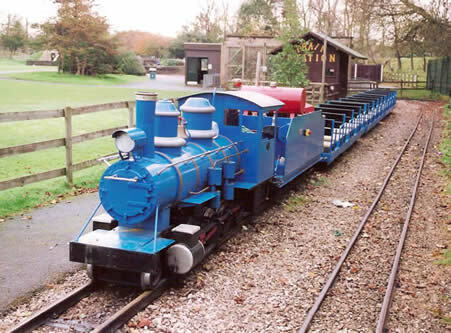 The line's original diesel loco, Cub, was rebuilt and now runs on the Cleethorpes Coast Light Railway under the name of John, and one of the railway's original steam locomotives, Muffin, was sold to the Lappa Valley Railway in 1976. The railway is located in the Rhiw Valley between the villages of Berriew and Manafon near Llanfair Ceirenion. It was built by Jack Woodroffe in the grunds of his home and is approximately ¾mile in length, forming a circuit, though there are plans to extend the line. There are three locomotives - Powys, a 0-6-2 Tank Engine designed by David Curwen and built by Severn Lamb; Jack, an 0-4-0 Tender Engine designed by Jack Woodroffe and Neil Simkin and built by Jack Woodroffe and TMA Engineering; and Monty, an 0-4-0 Diesel Shunting Engine outline powered by a petrol engine out of an Austin Mini. The railway is part of the amusement park in the Knowsley Safari Park. 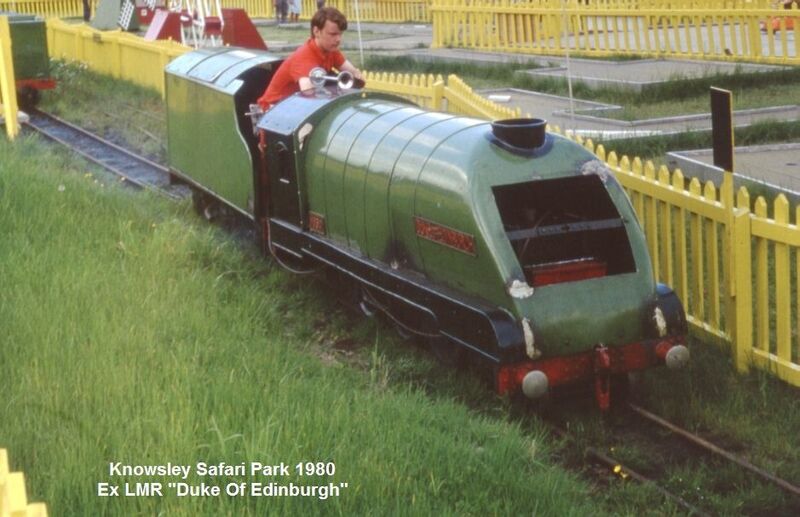 In its early days, the railway used stock and locos from the Southport Lakeside Railway, including Duke of Edinburgh. The line presently runs from the main station through woodland and beside the lake with a balloon loop at each end. The railway now possesses one Severn Lamb 2-6-0 steam outline locomotive. 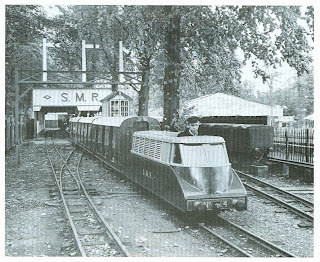 When the zoo was opened in 1970 it was decided to commission the construction of a 15" miniature railway from the engineering firm Severn Lamb. The railway is 700 yards and originally had two diesel powered steam outline locomotives and four passenger coaches. The line now has just one locomotive and two coaches. Originally built to a gauge of 14½" gauge by Cleethorpes Borough Council, the line was converted to 15" gauge in 1971. The railway's current length is 2 miles, running from Kingsway station over a 40 yd long viaduct, along the sea wall passed the workshops to North Sea Lane. The railway orginally used internal combustion powered stem outline locomotives constructed by Severn Lamb, but in the 1990s the railway acquired much of the rolling stock from the Sutton Miniature Railway, including the iconic Bassett Lowke locomotive, Mighty Atom. The railway now posseses 9 team locomotives (including a replica of the Heywood loco Effie) and six internal combustion locos. The railway is nearly half a mile long with dog bone shape. When it first opened it had two locomotives - “King George” a classic 4-4-2 built by Bassett-Lowke in 1915 and a Coleby-Simpkins 4-4w diesel called “Wendy”. These were later joined by Bill Stewart’s 4-6-2 “Flying Scotsman”, a 4-4-2, “John”, built by Albert Barnes of Rhyl in 1921 and one of many ‘Rio Grande’ 2-8-0 steam-outline petrol hydraulic built on an American design. 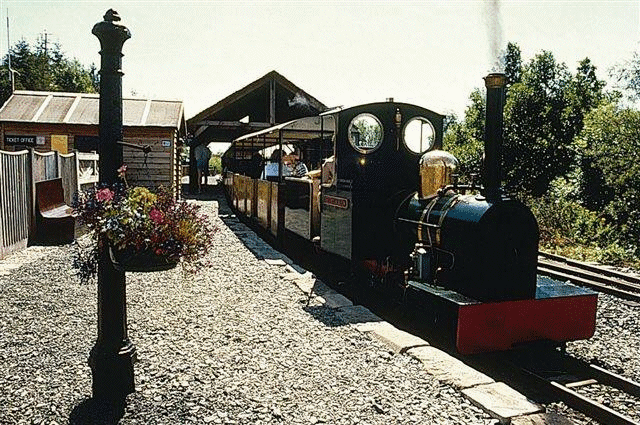 The site was sold in 1991 and remodelled with trains being hauled by “Wendy”, the sole surviving locomotive. It closed again in 2005 and became derelict. In 2011/12 a senior member of the National Railway Museum recognised the line’s importance and, with the site’s owner, devised a revival plan. 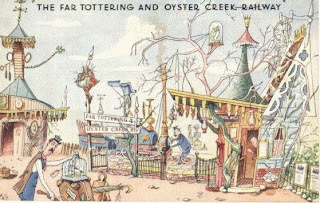 The Friends of the Thorpe Light Railway was formed to put this into practice. Bressingham Gardens was established by Alan Bloom in the 1960s to house his growing collection of railway stock and showcase his gardening techniques. The gardens include static displays and four operational railways - a standard gauge line, a two foot gauge railway, a 15" gauge line and a 10¼" railway. There is also a 7¼" track for model engineers. 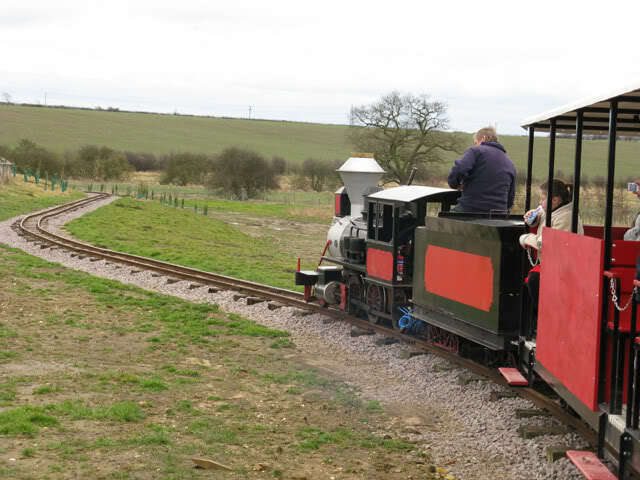 The 15" gauge Waveney Valley Railway was opened in 1973 and forms a circuit of 1½ miles around the lower area of the Bressingham estate. It currently has three steam locomotives and two diesel locos. Opened in 1973, the 15" miniature railway is located in the Amusement & Leisure Park on the seafront at Tramore. There is a circuit of 400yds around a boating lake with a tunnel. The railway has a Severn Lamb Rio Grande 2-8-0 steam outline petrol hyrdaulic locomotive. 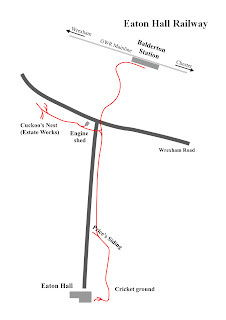 The original 15" gauge track ran between Benny Halt and East Wheal Rose giving a run of approximately 1 mile. Severn Lamb constructed the line's steam locomotive Zebedee. Three more locomotives arrived from Longleat in 1976. In the 1970s a 7¼" gauge railway was laid around a smaller lake, whilst a third railway, of 10¼" gauge was opened in 1995. The 15" gauge railway now possesses two steam locomotives and two diesel locos while the other railways each have two internal combustion locomotives. The railway is located in Craigtoun Country Park which is not far from St Andrews in Scotland. When opened in 1960, there was a 7¼" gauge raulway which was replaced in 1975 by the present 15" gauge railway. The railway runs in a circle around a boating lake through the gardens, passing the historic Dutch Village. The railway has one Severn Lamb Rio Grande steam outline locomotive and three coaches. This was originally constructed as a short shuttle railway but was adapted to provide transport for visitors between the Pleasure Gardens and the Palace. The line is roughly 1000 yds in length, with run-round loops at each station. It originally had passing loop at the mid-way point allowing for the operation of two trains. The line has a three-road engine and stock storage shed. The original locomotive was named Sir Winston Churchill (since replaced by a locomotive of the same name), and has been joined by locomotives Muffin and Tracy-Jo. The 15" gauge railway at Fleetwood replaced an earlier 10¼" line which was constructed in the early 1950s. The railway ran along the seafront but lasted for only seven years, being closed in 1982 after repeated acts of vandalism. 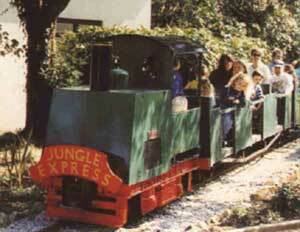 Paradise Park in Hayle, Cornwall is a primarily a bird garden but also houses the 15" gauge Paradise Railway. The railway forms a circuit around a house and includes a tunnel, three level crossings and a bridge. 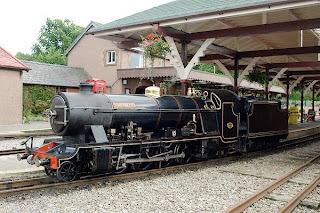 The railway used to have an 0-4-0 tank engine called Chough but trains are now hauled by a Lister diesel Zebedee which formerly ran on the Longleat Railway. 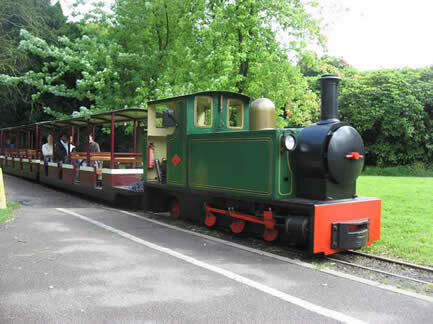 The West Midland Safari Park Railway runs for 700 yards round the safari parks Hippo Lake, taking passengers from the main entrance to the amusements park. Trains consist of Severn Lamb stock, including a 2-8-0 steam outline locomotive based on a US prototype. Haigh Hall originally belonged for many ages to the Bradshaigh family - the local MP for Wigan before passing to the Earl of Crawford. The Hall and its park are now owned by the Wigan Leisure & Culture Trust. 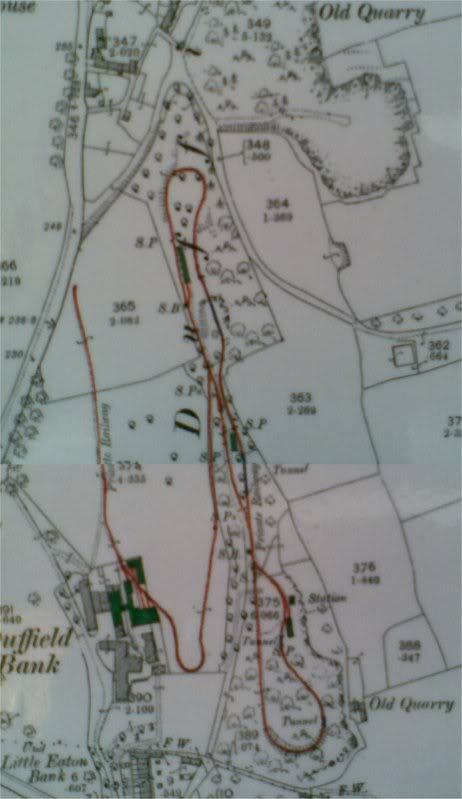 The track runs through woodland in the form of a circuit which is pinched where the tracks pass close to each other. There are two stations ‘Haigh Hall South’ which is the main station which also has a three road engine shed and ‘Haigh Hall North’ which is adjacent to the estate's walled garden. For a while the former Fairbourne Guest steam locomotive Katie ran at Haigh Hall, but that is now owned by Windmill Farm Railway. The line has two locomotives - Rachel, a former Fairbourne Railway diesel and Helen, a steam outline 0-6-0 diesel locomotive built by Alan Keef Ltd. The railway ceased operations in 2011 and there is no news at present as to when it will re-open. The Rio Grande Miniature Railway forms a circuit of about 700 yards circuit passing the Water Slide and animal enclosures in Paultons Park. There is one locomotove, a Severn Lamb steam outline Rio Grande diesel hydraulic locomotive, which hauls four covered toast-rack coaches. The Heatherslaw Light Railway is located near Cornhill on Tweed in on the banks of the Rover Till in Northumberland. In 2002 the original line was extended, adding a passing loop and 1.2 kilometers to the line to make an overal end to end run of two miles. . The line has two steam locomotives - 0-4-2 Lady Augusta built by the Ravenglass & Eskdale Railway and 2-6-0 Bunty built by Alan Keef and a diesel loco, Clive. The railway is located at Westport House in County Mayo. The railway runs through the grounds and has one Mk2 Rio Grande Severn Lamb steam outline 2-8-0 petrol hydraulic loco and three coaches. The Bure Valley Railway was constructed on the trackbed of the standard gauge railway from Wroxham to Aylsham which closed in 1983. The 9 mile route also hosts a long distance footpath. The railway presently owns eight locomotives, five steam and three diesel. The railway has 17 bridges (one of which spans the River Bure) and boasts the only rail tunnel in Norfolk. This 3.5 mile long railway runs along the former trackbed of the standard gauge railway from Clayton West to Clayton West Junction. 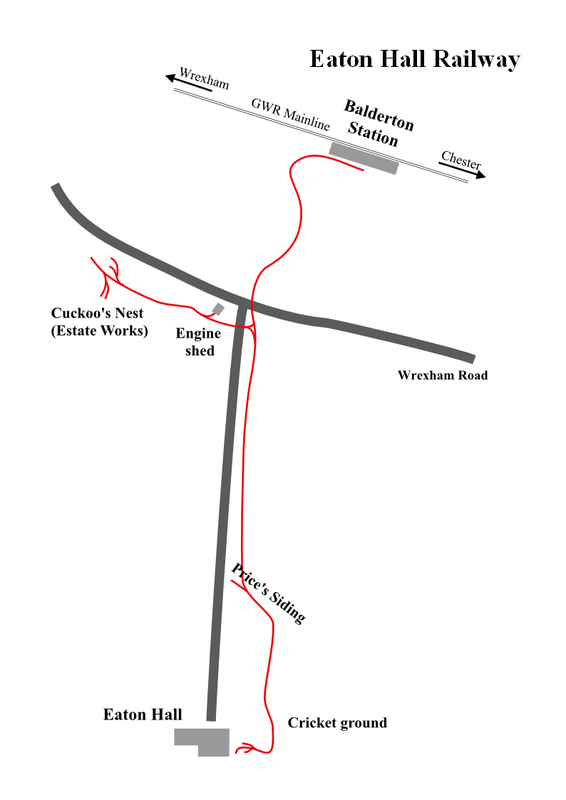 The railway was originally one mile in length running from Clayton West to Cuckoo's Nest, named after one of the stations on the original Eaton Hall Railway. The line has four steam locomotives - including two articulated locomotives, one diesel and one petrol locomotive. 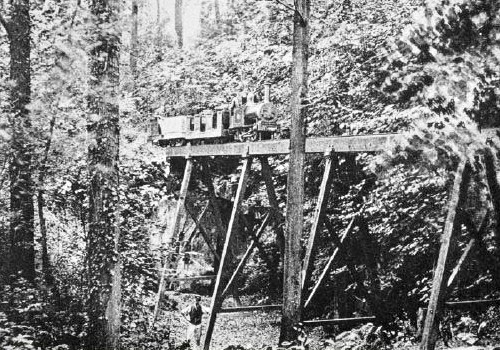 The ¾ mile long Perrygrove Railway was constructed by Michael and Frances Crofts as a tribute to Sir Arthur Heywood's minimum gauge proposals. The line hosts the Heywood Collection, a set of artefacts including replicas of some of Sir Arthur's rolling stock - most notably the Eaton ralway locomotive Ursula. The line has three diesel and four steam locos - one of which is articulated. The railway was set up in 1997 by Austin Moss to store and run his collection of 15" historic locomotives and rolling stock. The collection includes stock from the 15" Fairbourne Railway, the Lakeside Railway at Southport, the Romney Hythe and Dymchurch Railway, Bressingham Gardens, Liverpool Garden Festival and Dudley Zoo. 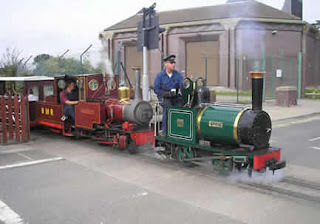 The railway presently possesses four steam locomotive, including Katie (from the Fairbourne Railway), and 13 diesel/petrol locomotives, including two four Barlow steam outline locomotives from the Lakeside Railway at Southport. The railway was constructed during the winter of 1999 and 2000 and when it opened early in 2000 it was only 100 yards long with two locomotives. Over the years the line has steadily been extended to 800 yards with two stations (Loxley and Welldale), cuttings and a tunnel. The line has two Hardy steam locomotives (Pet and Smokey Joe) and three internal combustion powered locos. Although the farm park on which the railway was situated has closed, the railway still operates. 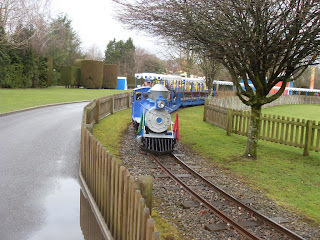 Situated in Oakfield Park in Raphoe, County Donegal, the Difflin Lake Railway is currently 3349 metres in length (though there are plans for it to be extended) and runs through the park, with a ruling gradient of 1:30. The line possesses two locomotives - 0-4-2T steam locomotive, The Duchess of Difflin, built by Exmoor Steam Railway Co. and 0-4-0 diesel, Earl of Oakfield, built by Alan Keef Ltd. The line has two bogie coaches in Donegal Railways livery, two four wheel coaches and three good wagons. 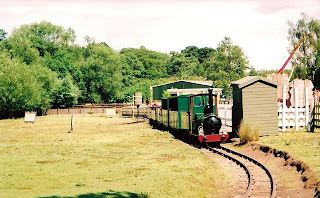 The railway is situated in the grounds of Evesham Country Park in Worcestershire. It was originally set up by Jim and Helen Shacknell for their collection of locomotives and rolling stock. The locomotives include the restored Greenly Class 30 Count Louis and coaches from the Fairbourne Railway. There are also two further steam locos - 0-4-0 St. Egwin constructed by Exmoor Steam Railway and 0-6-2 Dougal built by Severn Lamb. There are also three diesel locos - Bessie, Sludge and Cromwell. 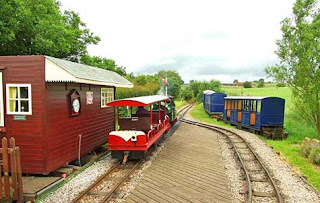 The line runs for 1¼ miles in total from the main station, Twyford Downs, through orchards and a tunnel to a balloon loop on which is situated Evesham Vale Station before returning to the main station where there is a turntable, run round loop and the engine and carriage sheds. The railway changed ownership in 2012. It is now owned by Adrian and Sandra Corke who were long term volunteers on the Leighton Buzzard Narrow Gauge Railway. Adrian was head of engineering at the Buckinghamshire Railway Centre. It would appear that the Greenly locomotives are now no longer housed at Evesham but a third steam locomotive "Markeaton Lady" has been acquired and is presently being overhauled for use in the line. 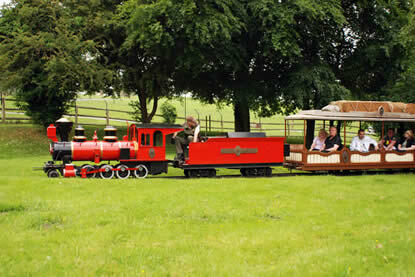 The railway runs for just over half a mile through Twinlakes Park near Melton Mowbray. The railway has two stations; Canada Quay Station and Imoogi Dragon Station. The railway runs from Canada Quay Station, past the two lakes which gives the park its name and then takes a reverse balloon loop on which is located Imoogi Dragon Station. The line posseses two Severn Lamb locomotives in US steam loco outline. Built originally as a 2' gauge railway, the line became disused and fell into neglect. It was restored in 2010 as a 15" gauge railway. The railway forms a circle around the lake, with a main station where there is also a loco shed. There is presently one loco - a Severn Lamb Rio Grande steam outline diesel which was based originally at Cleethorpes and then at Windmill Farm. This is probably not a complete or definitive list, so my apologies for any omissions or inaccuracies. If you spot any errors or have information about railways which I have missed out - or have any further information which you feel could be included, then please leave a comment below.